Inventory We are a resale marketplace, not a box office or venue. Ticket prices may exceed face value. This site is not owned by MTS Centre . 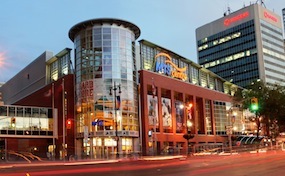 The MTS Centre is an indoor arena at 345 Graham Avenue in Downtown Winnipeg, Manitoba, Canada, at the former Eaton's site. It is owned by True North Sports & Entertainment Limited, at a cost of $133.5 million CAD, and is 440,000 square feet in size. It opened on November 16, 2004, replacing the since-demolished Winnipeg Arena. It can seat 15,015 spectators for ice hockey and up to 16,345 spectators for concerts. It was formerly known as the True North Centre during planning and construction before Manitoba Telecom Services bought the naming rights. MTS.CentreWinnipeg.com is not affiliated with any primary box office or supplier. We are a privately owned and operated business specializing in sales in the secondary market. To buy tickets for any MTS Centre events in Winnipeg simply click on the event of interest or call our operators at anytime.